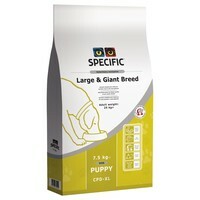 Specific Everyday Puppy Large & Giant Breed CPD-XL Dry Food for Puppies is a nutritionally complete diet for larger breed puppies with an adult weight over 25kg, from weaning until they reach 80% of their adult weight. Made with a moderate energy and calcium content to support the development of strong joints and bones without the risk of accelerated growth or obesity, this Specific Puppy diet also contains balanced levels of energy, proteins, vitamins and minerals to meet the nutritional requirements of growing puppies. Specific Puppy Large & Giant Breed also contains a high content of Omega-3 to support the development of your puppy’s brain and vision, as well a healthy coat and skin. Rice, Wheat, Maize Protein, Fish Meal, Pork Fat, Yeast (including Source of Beta-1,3/1,6-Glucans), Hydrolysed Poultry Protein, Minerals, Fish Oil, Eggs, Powdered Cellulose, Vitamins and Trace Elements, Psyllium Husk, Lysine, Methionine, Threonine, Tryptophan, L-Carnitine.